A great way to supplement your guitar practice is by doing strength training exercises to strengthen the fingers in your hands. Assuming you’re already putting in the time needed with practice on the guitar, strength training can help you along the way. Having more strength in your fingers makes the things you need to do while playing feel more effortless, therefore improving your technique. In this article, I’ll go through some of the things that I’ve done for strength training over the years. Greater strength means it takes less effort to execute the movements needed while playing. Needing less effort leads to more relaxation in your hand and arm when playing chords or single note passages, which contributes to being able to move and play more quickly. Your hammer-ons and pull-offs will feel easier and sound louder and clearer. Stronger fingers in the picking hand can lead to smoother, faster finger picking. Before I talk about the exercises I’ve done and the tools I’ve used for them, I want to point out that you need to be careful when embarking on a strength training regimen. It’s possible to overdo it and end up straining some muscles or even causing a longer term injury. The most important way to prevent injury is to give your fingers opportunity to rest after an exercise session. When I was strength training regularly, I would limit myself to doing it only three times a week, with at least one full day in between sessions. During the day between exercise sessions you can still play or practice your guitar, just don’t do any strength training. However, if you’re ambitious and already putting in multiple hours of practice a day, it is a good idea to designate one day a week where you don’t practice or do strength training. For each session, you’ll want to develop some sort of routine. Below I’m going to show 4 different exercises. What I would do is 2 rounds of each exercise for each hand, and then be done with it. By limiting myself this way, I was able to strength train regularly for a couple years without developing even the slightest strain or injury. Another thing I’d like to go ahead and say is that strength training is in no way a replacement for practicing. If you already have good practice habits and want to supplement those with another activity you can do while away from the guitar, you’ll get great benefits from strength training. However, if you don’t practice much, or your practice is distracted and unorganized, strength training won’t produce any magical results. Finally, make sure you are doing all exercises with both of your hands. Regardless of whether you are looking to improve strength specifically for fretting hand or picking hand purposes, you need to keep a balance of strength between the two hands. The only tools you’ll need to strength train in the way I did is a Grip Master and some hair ties or rubber bands. There are plenty of other products out there, these just happen to be the ones I used. The Grip Master comes in different levels of tension. I eventually got to the point where I was using the light, medium, and heavy tension models for different exercises. However, I started off just using the light tension model. I used it for a few months before going up to the medium tension model. I then used it for a few months before switching to heavy tension. The first few exercise I’ll show use the Grip Master. For the first one, you hold the Grip Master in your hand, place the tips of your fingers on the keys, and press repeatedly with each finger. I would just do enough reps with a finger until that finger felt tired, and then move on to the next finger. 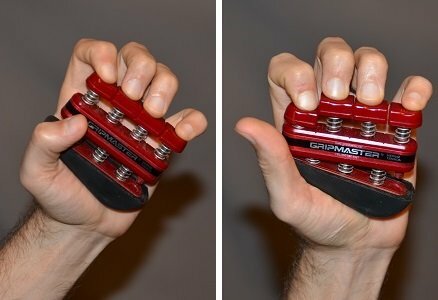 For each of the Grip Master exercises, I would focus on preventing movement in my other fingers. For example, if I was doing reps with my index/first finger, I would also try my best not to move or press down with any other fingers. This helps to exercise the finger you are working on more intensely, while also developing good finger independence. The next exercise is similar to the first one. For this one, I would press the keys down using the lower portion of my fingers instead of the fingertips. 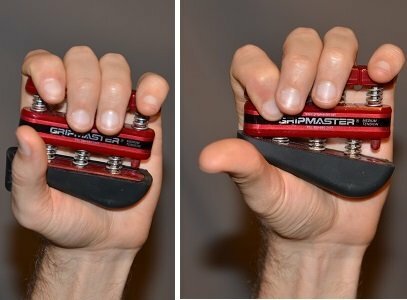 To strengthen my thumb, I would turn the Grip Master around in my hand and press 2 keys at the same time with the thumb. Like the other exercises, I would do enough reps to where my thumb felt tired. While doing this, I was careful to make sure that I was pressing the keys down using only movement from my thumb, without extra movement coming from the fingers on the other side of the Grip Master. The Grip Master exercises are good for developing the muscles on the underside of the hand that are used for squeezing or bringing your fingers down on the strings. I also wanted to develop the muscles on the other side of the hand that are used in raising the fingers. My own reason for this was to help with being able to finger pick more quickly, but it can also help with bends or trills with the fretting hand. To work these muscles, I did some exercises using hair ties. Rubber bands could also work, but I felt that hair ties were a bit more comfortable to work with. To work my index, middle, ring, and pinky finger, I would do the exercise shown in the photo below. I would loop 1 or more hair ties under my thumb and around the finger I was exercising. I then used my other hand to hold the hair tie in place on my thumb, and would extend my finger outward. I paid close attention to make sure my thumb was stationary while my other finger extended. 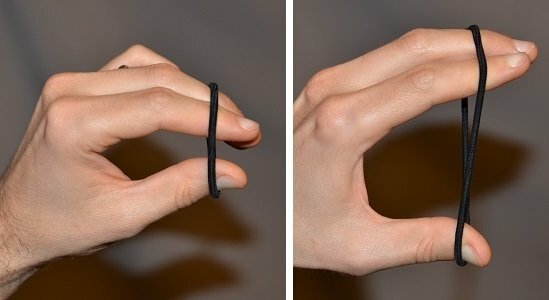 To work my thumb in this way, I looped the hair tie around my thumb and a couple other fingers and then extend my thumb outward as shown below. As long as you proceed with caution and restraint, strength training can be an excellent way to build a greater sense of ease into your guitar playing. Always beware of any pain you feel either during or after a strength training session. If you do feel even the slightest bit of pain, take a break from doing the exercises for however long it takes for the pain to go away. Posted in Practice, Technique and tagged Practicing Without a Guitar, Strength Training, Technique.